If you’re happy and you know it, clap your hands. If you hear a squeak, you may be on top of what students are now referring to as “the clapper,” located in front of Becker Hall in the Alumni Plaza of Huntington University. Few students might know “the clapper” as Huntington College’s Centennial Medallion. However, what even fewer may know is that when standing on it, they are resting on a piece of Huntington University’s history. 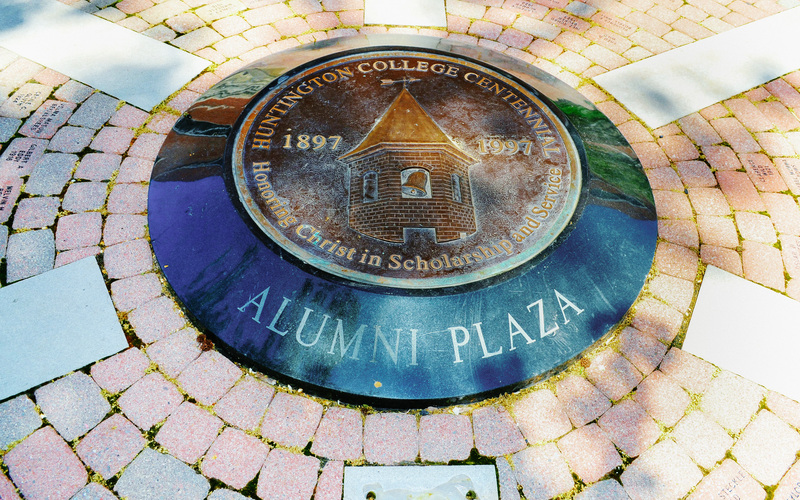 The time capsule beneath the Huntington College Centennial Medallion was formed in honor of the 100-year anniversary of the school. In 1897, the university was formed under the name of Central College, and was one of only a few United Brethren Colleges in the United States. In order to commemorate the occasion, Central College put a time capsule in the cornerstone of Becker Hall, one of the first buildings erected on campus. Inside the time capsule, they placed a Bible, some Sunday school booklets, and a copy of the United Brethren publication, “Christian Conservator,” as well as the business card of the contractor who built Becker Hall. Randy Newman, archivist at RichLyn Library, has copies of all these documents in the archive room in the library. In 1997, the centennial year of Huntington University, Becker Hall was touched up, the time capsule was removed and its contents were examined. By that time, some of the documents had been partially eaten by insects and were replaced with copies. The rest, however, were put back in the capsule and placed in the cornerstone of the building, where it still sits today. At the time the original time capsule was being examined, another time capsule was laid in the ground beneath the Alumni Plaza in front of Becker Hall. Jerry Gressley, director of Physical Plant, was present for the laying of the Centennial time capsule in 1997 and helped seal it up. At this point, all documentation and information on the time capsule seems to run dry. According to Newman, there is only one article he could find on the Medallion and Alumni Plaza, with no mention of there even being a time capsule underneath. The time capsule mysteries continue to magnify in regards to the third and final time capsule in a cornerstone of the Huntington Union Building (HUB). Due to insufficient documentation, there is much discrepancy in the dates for this time capsule. Newman stated that the time capsule in the HUB was placed there in the mid-1960s. This claim is corroborated by the cornerstone on the side of the building, which has the date “1967” carved into it. Both Gressley and Jeff Berggren, former vice president of admissions and marketing at the time, say that the time capsule in the HUB was placed during Homecoming weekend in 2005. According to Berggren, who was present during the event, the time capsule was filled with Huntington College paraphernalia available at the bookstore and admissions office during the 2004-05 school year. There is no documentation to corroborate one side over the other. Due to this overall lack of documentation found for any of the three time capsules, much of the story remains a mystery, and is likely to continue to be so until the time capsules are reopened and their contents examined. According to Newman, however, the reopening of the capsules is unlikely to happen any time soon.